Early in September, 1998, I had the pleasure of seeing three of our native gentians, Gentiana clausa, Gentianella quinquefolia, and Gentianopsis crinita. I did this as a participant in one of the summer plant walks sponsored by the Finger Lakes Native Plant Society, led by David Nakita Werier. We started our walk in the Connecticut Hill area and found Gentianella quinquefolia (stiff gentian or ague-weed) after a few minutes of searching, on the margins of a gravely road turn-around. 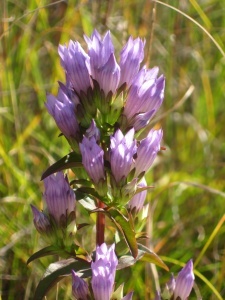 This gentian is listed in Rare and Scarce Vascular Plants of the Cayuga Lake Basin (by Robert Wesley) as “scarce”, which means there are six to twenty known occurrences. It is a pretty little thing: an annual or sometimes biennial. The specimens that we saw were all shorter than typical, perhaps because they had been mowed earlier in the season by a road crew. Nonetheless, they were in full flower. Gentianella quinquefolia has exquisite small flowers in many terminal clusters of three to five. When viewed from above, it looks like a handful of 15 or 20 small amethyst gems. These flowers were generally closed, although they do open up in the sun when mature. After finding it in this spot, we walked back down the road and found it in a dozen more places, always on the side of the road ditch, where the soil looked heavy but full of gravel. I should mention that this was a wooded area; the only sun exposure was the road and road margins. Our next find was half a county away in Shindagin Hollow, where Gentiana clausa was growing on the side of the ditch. It was competing with other rampant growth and was about 2.5 feet tall. 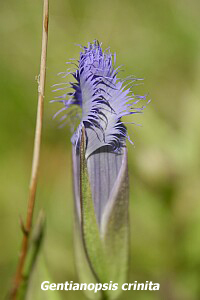 Gentiana clausa, also listed as scarce by Wesley, is called the closed or bottle gentian, for the simple reason that the flowers never open up. They are borne in terminal and sub-terminal clusters. I have to admit that I have a soft spot for this gentian, because for many years it has grown happily in my garden in Allegany County, in extremely heavy clay soil. It is stunning in bloom and even makes an excellent cut flower. It gets a wonderful reddish cast on the foliage as the weather turns frosty. 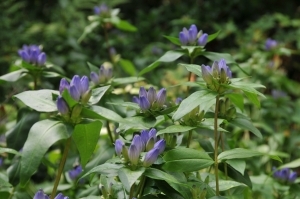 Gentiana clausa is often confused with G. andrewsii. In fact, I always thought the gentian that I grew was G. andrewsii. To tell the difference, you take a blossom, slit it lengthwise and open it out flat. On G. clausa the plicae that are between the segments of the corolla are divided into 2 or 3 segments and are not fringed. On G. andrewsii they are fringed. Our last gentian was one that I have always wanted to see: Gentianopsis crinita, the fringed gentian. This gem was very impressive. We could have gotten a perfectly good look at it without getting out of our cars. Out of respect, we did disembark, and took our life in our hands as we huddled on the narrow shoulder of the road, peered down into a wet ditch, and then gazed up a bank so steep that only one of our group ventured up it. He reported that the gentian grew not only in the ditch, but also quite a way up this bank. This site was sunny, but since there was water running in the ditch, I suspect that even the soil up the hill might have been moist. Gentianopsis crinita is a biennial, with single terminal flowers that were larger than I had imagined. 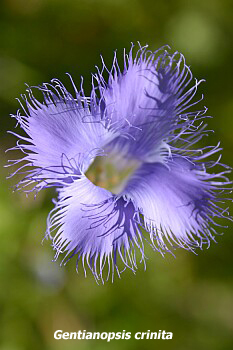 Each stunningly blue flower was about two inches long, with heavily fringed petals. Although on this site it was obviously thriving, it is listed as “rare”, which is two to five occurrences on Wesley’s list. When I got home from this “walk”, which I renamed a “drive”, I was tired—of driving—but thrilled to have seen these three plants in their native habitats. This article was originally written for and published in The Green Dragon, newsletter of the Adirondack Chapter of the North American Rock Garden Society.